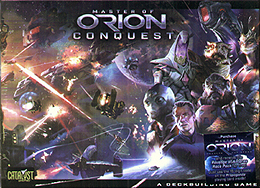 Master of Orion: Conquest is a two-player duelling deckbuilder. Play as one of two species in the galaxy - the humans and the shape-changing, mimicking Darlocks - as you build and fight your way to victory. Explore the galaxy to find new planets to colonize and use their production to build your fleets. Destroy the enemy's Home World and become the Master of Orion!